Ingram ISD is a growing school district located in western Kerr County. An important part of managing growth within a district includes expenditures for new and improved facilities. One of the first improvements scheduled for Ingram's current growth plan was a major renovation to their football field by TMC. 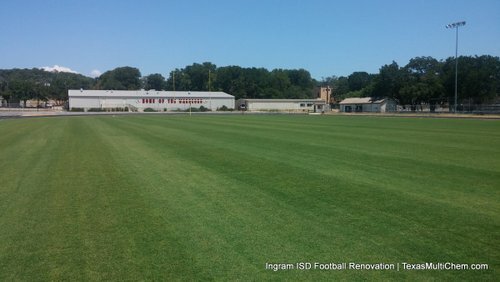 Ingram's new football field renovation involved removing the previous common bermuda grass surface, installing new field drainage, a new irrigation system, improved sandy loam topsoil and new hybrid bermuda turfgrass. The day after graduation we began spraying to kill the existing vegetation on the field. We then stripped and hauled off the original surface creating the subgrade. Natural grass athletic fields like this need to have some sort of engineered slopes to promote positive runoff of surface water. We laser graded the field giving it a precise, uniform crown. Once that was complete, it was time to install the drainage system. Ingram's field already had a fairly consistent downhill slope but it only had a single 4" drain inlet to take accumulated surface water and run it off the field through a small drain pipe beneath the running track. Anytime there was a moderate rain event, the water would hold on the field for a very long time as it SLOWLY drained through the small 4" inlet. In addition, the location and elevation of the existing high jump pad near the south end zone helped create a "bowl effect" that prevented the water from ever reaching the existing undersized drain. As a result, surface rain water would pool on the field and remain there for days, sometimes even running up and over the track in extreme situations. We improved the field's ability to drain water by removing the high jump pad, grading the subgrade and installing 6 catch basins down each sideline designed to take water from the surface and deposit it into underground drain pipes. These newly installed underground sideline pipes slope downhill and tie-in to two new 8" exit drainage pipes beyond the south end zone. These pipes were installed after boring two new exit pipe locations under the running track. Two more catch basins were installed near the exit pipe locations to take any surface water off the field and into the exit drain pipes as well. 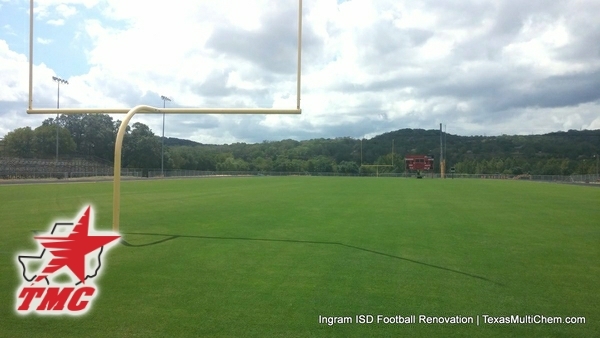 Visit the photo gallery to see all of the photos from Ingram's football field renovation. A brand new irrigation system was also installed as part of Ingram's new football field renovation. A new six row Hunter system designed to use their existing water well flowing up to 90 GPM from a 3 inch mainline. The well is situated atop the hill above the stadium and offers ample pressure aided by gravity. Like so many old natural grass athletic fields, Ingram's field was built a heavy clay topsoil many years ago. It's very hard to consistently grow high quality, healthy turfgrass in clay soil. A sports field with a heavy clay root zone is prone to compaction. Turfgrass cannot grow in heavily compacted soil profile because there is not enough oxygen due to the reduced pore space. This limits the overall plant growth due to restricted air and water movement into and through the soil. We imported over 2100 cubic yards of clean sandy loam topsoil and laser installed it over the prepared subgrade. This allowed us to create a solid 6" sandy loam root zone over most of the field. This enhanced root zone is a significant improvement and will allow the school district to maintain a very high quality and durable grass surface. Tifway 419 hybrid bermudagrass (big roll sod, grown on sand) was installed on July 21st as the new turfgrass surface. Tifway 419 is a significant upgrade from common bermudagrass and was developed specifically for athletic fields. It has a dark green color, is extremely durable, grows/repairs quickly and is far more resistant to draught conditions and diseases. With regular weekly mowing (ideal is 3 times per week during the growing season) at heights anywhere from 1/2" to 1", Tifway 419 has been an excellent sports field turfgrass for over 40 years and is an excellent playing surface for Ingram's new football field. After only nine days, the field was ready for it's first mowing. After about two weeks we topdressed and fertilized for the first time and remained on our controlled grow-in irrigation schedule. Mowing three times per week during the maintenance grow-in period helped the field begin to develop a more dense growth habit as early as possible and was ready for the first game within six weeks. 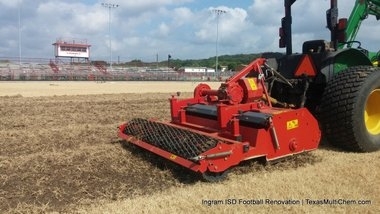 Is your football field due for a major renovation? Contact TMC at 1-800-292-1214 to discuss the many available and affordable options.